Enough talk about grocery shopping. I wanted to show you what I'm making for our Easter luncheon table. There will be one of these at each place of the table. This is a hollow, ordinary chicken egg, with an opening broken at the pointed end of the egg, then tea-stained with a strong tea solution using 2 plain tea bags and 2 cups of water. I immersed each entire hollow egg in the tea and left to sit for a couple of hours, doing 2 eggs at a time. The "stand" is one of my parents' napkin rings. (Egg cups would also work well as "stands" for the egg planters.) Just before Easter, I will fill the eggs with tiny plants, most likely violets, as they grow wild in our yard, and it looks like they will about be in bloom in time for Easter. Alternatively, I will find other small blossoms on stems in the yard and use the egg as a vase. 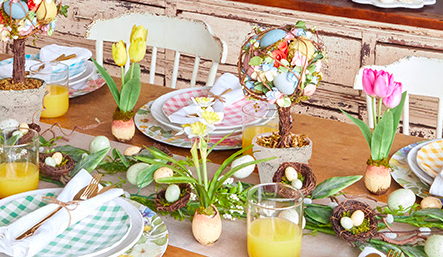 I got the idea from this Michael's ad (see the eggs with bulb flowers). I immediately realized that I could do something like this using just what I have at home. The eggshells would have been composted, anyway. The tea bags were freebies from a hotel stay a while ago. The napkin rings were something I already owned. And the plants or blooms will be scavenged from my yard. After Easter is over, the napkin rings will be returned to storage, the plants can be returned to the garden, and the eggshells can still be composted. I'll let you see how they turn out later in April. Just so you know, I was able to shake the contents of the egg out of the shell, as the opening was so large. And I didn't need to poke a hole in the other end, as I did when blowing out eggs. This is definitely much less time-intensive of a spring craft than the painted and speckled eggs. How lovely! You are bringing joy to yourself and your family. Maybe you could show us a picture of your completed eggshells? I'll definitely add a picture when they're planted. If they like what I have in my head, i think they'll be home-spun charming. Have a great evening, Kris! What a great idea. If I did that much decoration, I would definitely try this. Maybe I will any way. this reminds me a little of a craft project that I did with my kids when they were little. 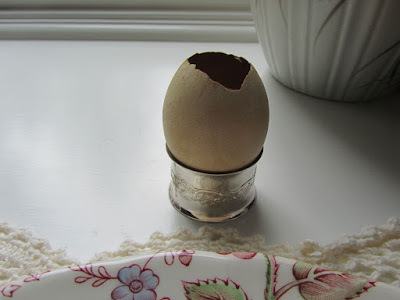 We filled hollowed out eggs, like above but not stained, with soil and planted grass seed. The kids drew faces on the eggs, and the grass looked like hair. They loved giving their egg-guys haircuts. This is an easy and less time-consuming Easter/springtime craft project. Hope you're enjoying a pleasant early spring evening, live and learn! Love that!! I think I'll do that as well.